Assemble patchwork mosaics while you travel with Alice and the famous characters of Wonderland and Looking-Glass Land! ? mad tea-party, unbelievable royal croquet, a merry sea quadrille... What other pictures await you in 6 locations? 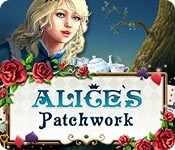 Assemble all mosaics and help Alice become the queen of this incredible world in Alice's Patchwork!